During the period 1845-1853 William Benitz, with successive partners, held ownership to most of the German Ranch. Over time its name has varied, it began as Rancho de Hermann, the Mexican grant named it Rancho de German, but today it is generally known as the German Ranch. In 1845 William Benitz and Ernest Rufus surveyed (by eye - a ojo) the area that would become Rancho de Hermann. 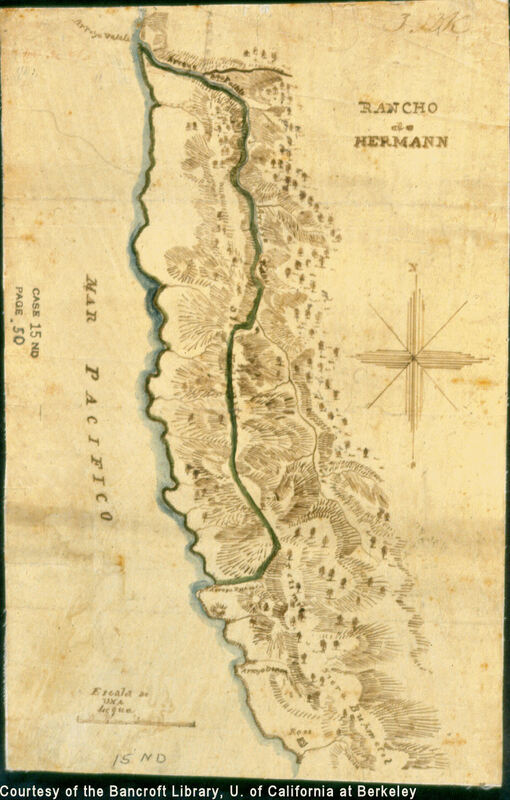 William drew the diseño (map, shown here) that was included with their petition for a grant from the Mexican government. They petitioned for approximately 5 sitios de ganado mayor (5 California leagues, 8,780 hec., 21,700 acres), about one league deep and five along the coast, bordered to the north and east by the Walhalla river (today the south branch of the Gualala river) and the Pacific Ocean to the west. During those same proceedings, the petitioners presented a document signed by Governor Pio Pico in which he describes the Rancho de German as being “above the Ross settlement that was occupied by the Russians” (mas arriba del establecimiento de Ross q. ocuparan, los Rusos). Lynn Hay Rudy, in her book "The Salt Point Township", states the border was today’s Stockhoff Creek, i.e. the above mentioned Arroyo Dichoatta / Dichatta. Rufus travelled alone to Los Angeles to petition the Mexican governor (Pío Pico) for the rancho. At that time, the Mexican government for security reasons did not like making grants along the coast to multiple owners. The grant was therefore made to Ernest Rufus alone on April 8, 1846; with William Benitz a silent partner. However, Rufus, while in Los Angeles, gave away 2½ leagues, 1¼ leagues each to Frederick Hügal (Hugul) and Henry Haegler — at the southern poorer end. But when Hügal took the best part in the north, Benitz and Rufus reduced his share to one league. Ernest Rufus left the partnership in June, 1849, exchanging his share of Rancho de Hermann for $1,000 and a half share in Rancho New Breisgau. In July, 1849, William Benitz and Charles Theodor Meyer bought out Hügal. Patented: at 17,580.01 acres, on 30th of July, 1872, to Charles Meyer, et al (about 15 years after Meyer & Benitz had sold it). Disposition: Per William’s letter of June, 1853, he and Meyer sold a property of 11,000 acres (i.e. 2½ leagues) for $26,500 — almost certainly their share of Rancho de German. According to the deeds (see Sonoma Co. Real Estate), in June, 1855, they sold it to Charles Wagner and William Bihler for $15,000, and were prepaid (the wording is unclear) $11,500. Purpose: Benitz, Rufus, and Meyer intended to graze cattle on the rancho’s pastures, on the ocean (west) side of the coastal hills. Conveniantly close to Fort Ross, it doubled their grazing land. They were not overly interested in the timber, which covered the river (east) side of the hills. Interested in the rancho as an extension to Fort Ross, they never lived on it permanently themselves. Hügal made improvements on his league: a house, grist mill, fences around his crop-land, and a barn. We don't know if Benitz and Meyer made use of these facilities when they bought him out in 1849. They likely herded their cattle to market in Petaluma, much as William Bihler did later when he owned the ranch. Please see Fort Ross for more about the cattle grazing. Name: The accepted story is that Ernest Rufus named it Rancho de Hermann after Hermann (or Armin / Arminius), the German national hero who united the tribes that defeated the Roman legions in 9 A.D., at the Battle of Teutoburg Forest. The Mexican grant referred to it as Rancho de German, German being the correct spelling of Herman in Spanish. Eastern border (Width): When in 1846 Benitz and Rufus scouted the area to include in their petition, they did not ride down to the Gualala river that was to be their eastern border. The east sides of the coastal hills were covered in timber thick with brush & fallen trees that made riding throught them dangerous. Furthermore, they were interested in grazing land, not timber. Without actually seeing the river, they estimated it to be one league (2.6 miles) inland from the coast. Per a modern map, the river at the north end is only 1.5 miles inland. Consequently, the size of Herman ranch shrank from 5 to 4 leagues when patented in 1872 at 17,580 acres (7,047 hec. ), leading to disputes over land titles. Western border, the Sonoma County coastline: Between 1849 and 1853, William Benitz and Charles Meyer were partners in the ownership of Fort Ross (Muniz rancho & the Russian settlements) and about ¾ of Herman Ranch. That is, they owned about 30 of the 33 miles of the Sonoma County coast north of the Russian river, representing approximately 2/3 of the entire Sonoma County coast. The other third, the coast south of the Russian river, was owned by the Bodega Rancho. The missing 3 miles (1¼ leagues) in the north were from the Herman Ranch, given to Henry Haegler by Ernest Rufus.